Battery powered data logger for measuring and recording low range pressures. 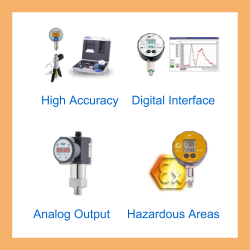 Designed for use in industrial environments with IP65 environmental protection and optional intrinsic safety. Available in pressure ranges from 10 mbar (4 inH2O) up to 300 mbar (120 inH2O) vented gauge. The LEO Record Capo low pressure logger uses a capacitive ceramic sensing diaphragm which is particularly suited for measuring low range air pressures. Logging procedures are downloaded via a desktop, laptop or pocket PC computer using the Logger software provided and once the results have been recorded they are uploaded for future analysis and generation of reports. The data can also be easily exported in generic database file formats to other software applications. Measuring gas pressure being delivered to a coffee roasting machine. Monitor and store natural gas supply pressure readings to check between gas meters and boilers to determine whether fluctuations in supply pressure is causing your industrial/commercial boiler to trip off. Measure low levels of pressure being fed to a natural gas fueled DC power generator to identify issues with insufficient supply. We are looking to obtain a data-logger which we can connect to a natural gas supply pipework which serves a number of boilers in our building. We believe the incoming gas supply pressure is changing and causing the boilers to trip out when it dips below the low pressure threshold. 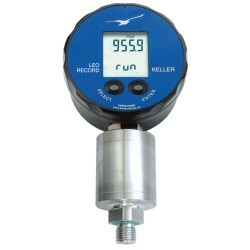 The pressures we need to monitor should be between 0 and 45mbar gauge and we will need to download the recorded gas pressures with a USB connection and software installed on our laptop computer. Would the LEO Record Capo satisfy this requirement? Yes, the LEO Record Capo would be suitable for this application and we would suggest a 100 mbar range to cover the range required plus any over-pressures. We need to monitor LPG & Natural gas, and the range of the device needs to be capable of reading from 0 to 75 mbar, what LEO Record Capo would we need to measure this? Is it possible to provide a USB cable that is 5 metres long with the LEO Record Capo (Ei)? The cable has a fixed length of about 2 metres. The cable can only be connected to the instrument in a safe area, so it is necessary to remove the instrument from the hazardous area for data upload or configuration purposes. What is the logger memory for the LEO Record Capo low pressure datalogger and can it log pressure and temperature at the same time? Yes you can also choose to record temperature, but this a secondary measurement behind the pressure sensing element. If you log pressure and temperature, this will reduce memory capacity for the total number of pressure and temperature records by 50%. 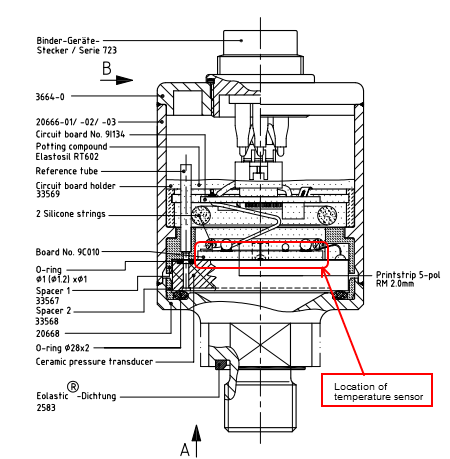 What is the exact position of the temperature sensor inside the LEO Record Capo pressure datalogger? It is a KTY type temperature sensor which is soldered onto the circuit board 9C010 shown in the image below for the pressure sensor type used inside the pressure logger. This board is placed adjacent to the capacitive pressure sensor. How do you connect the negative and positive port on the differential version, do you have a drawing or picture of the connections for this version? The differential version looks very similar to the gauge reference version except there is an additional Firma SMC pneumatic fitting for the negative side pressure which is fitted to the underneath stainless steel cylindrical body just beside the positive pressure G1/4 male fitting. 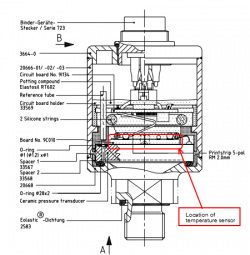 In order to connect the negative side fitting you will need to use a length of flexible 6mm diameter tubing, once fitted the pneumatic fitting assembly can be rotated for flexibility during installation. A Firma SMC pneumatic fitting to G1/4 male adapter is also provided to connect to the other end of the tubing so that you have the same process connection for both the negative and positive pressure connection. What is the operational lifetime of the battery? The battery lasts up to 2 years at 1 recording every 10 seconds. I need the datalogging to function for a period of 14 weeks, can the LEO Record Capo do that? You can store up to 28,000 measuring values with a time interval of greater than 15 seconds. So over 14 weeks you would need to set a logging time interval of no less than 5 minutes. If you also decide to log temperature as well you will need to increase the interval time to 10 minutes. We would recommend increasing the interval to as much as possible and running a trial over a few days to make sure the memory is being used as expected. What type of battery is used, and is it rechargeable? The battery is a SL-760 Lithium type and it is not rechargeable. Is it possible to install the logging software on more than one computer? The logging software can be installed and used on any number of computers and used with any number of LEO Record loggers. What spec would I need to monitor gas supply to gas boilers? We have boilers at a hospital that lock out. We think that the gas meter supplying them is to small, or the supply gets interrupted overnight. I’d like to get a detailed log of what is happening overnight, so that we can move forward and sort this problem out? We need to measure the pressure of LPG and Natural Gas to our coffee roasters. Our input ranges are 4 – 11 in WC Natural Gas and 11 – 14 in WC Propane. We are hoping to use this as a troubleshooting tool for our systems. A 50 mbar range LEO Record Ei Capo would cover the measurement range between 4 and 14 inWC. I need to be able to log the incoming gas pressure of my boilers for a week to determine if I am experiencing gas pressure drops that are preventing me from running all my boilers. I want to be able to down load the data onto a graph or similar afterwards. If you set the logging interval time between readings to 1 minute, you will be able to continuously log for a period of 1 week without filling up the logger memory. Is this datalogger completely self-contained with pressure sensor and data logger, all operated with a internal battery? Yes the logger is self contained including battery power for data logger & pressure sensor. Can you change units to inches water column (in. w.c.)? Yes you can select inH2O on the display which is the same as inWC. I need to monitor and log data from a natural gas pressure supply which is fed to boilers operating between 3-7 “WC. We would suggest a 30 mbar range LEO Record Capo, since 7 inWC is equivalent to ~17 mbar. We are measuring purge air pressure to identify why our variable speed drives are tripping on purge failure. We need to take a measurement each second with a resolution of 1 mbar. We need readings in millibars with a maximum working pressure of 30 mbar. As the variable speed drives rarely trip and the time scale is only 1 second is it possible to equip the manometer memory with a continuous overwrite function, so we can leave it for long periods and retrieve it after a trip? There are two modes of logging you can use to capture rare brief events. You can set the logger up to log based on an event, and when it notices a pressure change, it will log from that point onwards until the pressure returns to nominal levels. The other is to log continuously and loop the memory so that it overwrites the oldest data. Please select the options you require for the LEO Record (Ei) Capo Low Pressure Logger in your application and request a quote. Send us your enquiry for LEO Record (Ei) Capo Low Pressure Logger to get assistance with this product type.